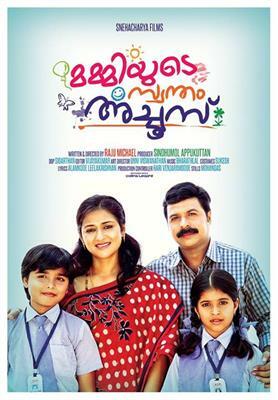 Mummiyude Swantham Achoos malayalam movie directed by Raju Michael will feature Sreedhanya and Master Renish lead. Other than Raju Michael, Devan, Jayan, Jaffer Idukki, Kollam Thulasi, Murali Mohan, Urmila Unni, Ranani Murali and Baby Reni would give life to other prominent characters in the movie. Mummiyude Swantham Achoos is produced by Sindhu Appukuttan under the banner Snehacharya Films. For the lyrics of Alamkode Leelakrishnan, the tunes are set by Bharath Lal. Malayalam film industry has always stayed as a unique platform for budding artists to showcase their talents on silver screen. In the midst of young generation filmmakers, it would be encouraging to see the entry of a film passionate who are ready with his debut project made for the family audience. Raju Michael who has an experience of staying behind the camera is up with an attention-grabbing theme. 'Mummiyude Swantham Achoos' as titled, revolves around a man and his struggle against corruption and corrupted people. Roy (Raju Michael) is a gifted village officer who has shown his managing skill while in office. He has been newly appointed for the post of village officer in the Karuvatta village. As a man with commitment and honesty, Roy tired to uphold his innate persona which created intricacy in the lives of others. As he took firm decision against land acquisition and changing the structure of paddy fields, it infuriated the politicians. His firm steps brought some problems in his life. Roy led a happy life along with his wife and children. As he was forced to confront with some issues, the story takes a different shape which forms the crux of the movie. 'Mummiyude Swantham Achoos also will be the stepping stone for many new faces to grab the attention and make their own space in the industry. Scripted and directed by Raju Michael, the movie will feature Sreedhanya and Master Renish lead. Other than Raju Michael, Devan, Jayan, Jaffer Idukki, Kollam Thulasi, Murali Mohan, Urmila Unni, Ranani Murali and Baby Reni would give life to other prominent characters in the movie. Mummiyude Swantham Achoos is produced by Sindhu Appukuttan under the banner Snehacharya Films. For the lyrics of Alamkode Leelakrishnan, the tunes are set by Bharath Lal. The story and screenplay is handled by the director himself while the camera was helmed by Sidharthan. With Haripad as the location, the movie has finished shooting and is expected to reach theatres soon.